Nduja is one of the most famous products of the culinary tradition of Calabria, southern Italy. It is a smoky salami characterized by a soft and creamy consistency and a very spicy flavor due to the presence of Calabrian hot chili pepper that gives it a dark red color. It has a unique flavor, able to surprise and satisfy any palate, even the most demanding and refined ones. Nduja is one of the typical products of Calabria’s most beloved but, most importantly, more exported, both in Italy and in the rest of the world. 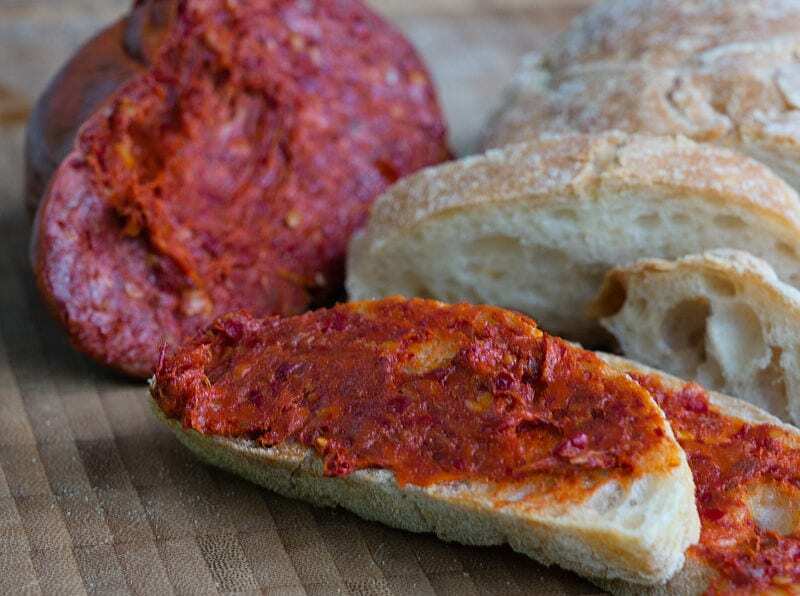 There is no reliable historical information and data on the origins of nduja, but according to some sources, it would have been brought to Calabria by the Spaniards around the sixteenth century. Other sources, however, claim that it was brought to southern Italy by the French during the Napoleonic period (1806-1815); perhaps this latter thesis can be considered as the most valid since there is a similar salami in France called “andouille“. From that moment on, Nduja has become part of the historical and cultural identity of the Calabrian territory, becoming one of the main products on which the region’s economy blends, also because around the year numerous events are organized with Nduja as the protagonist. The production of Nduja usually occurs in the winter months and is composed of fatty parts of pork (guinea pig, pork, and bacon) to which a good dose of spicy chili is added. After that, the mixture is smoked and seasoned. The nduja was born as a poor product, made in the past by peasants in order to preserve and use the remains of swine fever. With the passing of time, however, it became a true product of Calabrian excellence, also used in daily cooking and capable of bringing the genuineness of the goodness of the Calabrian culinary tradition. Nduja is a very versatile product and can be consumed in many different ways: spread on bread, croutons, bruschetta, pizzas, and buns for tasty aperitifs or can also be used to cook first courses or accompany semi-matured cheeses or flavor second meat dishes or vegetable dishes.